I love children dearly. I have taught several hundred in classrooms to read, write, add and subtract, and to love learning. But I have never had any of my own naturally, nor have I adopted. But I am an adopted daughter of God, born naturally to wonderful earthly parents back in 1947. God adopted me in 1993 when I asked Jesus to be my LORD and Savior, and the Holy Spirit indwells me. God’s story is the Bible. His children have been taken by the father of lies. At a mighty cost, God sent His Son to this earth to pay the full price, His shed blood, for our lives. One day, we will return home to our Heavenly Father, but in the meantime, we can be home with Him right where we stand, each moment of each day. His mercy rained down upon us so that He may reign in our hearts. This adoption is not because of anything we have done, but solely by God’s love and His grace. He chose us before He created the world. He predestined us for adoption. His willful purpose was to adopt us. He blesses us through His Son. He loves us. I believe that most children adopted in this world are adopted out of love, mercy, and grace streaming from the new parents’ hearts for a child, not due to anything the child has done. Yet, imagine how many times greater the love of God is over ours. Just imagine! In these portions of scripture, the word ‘adoption’ in the Greek language is “υἱοθεσία,” which is translated “huiothesia.” The first part “huio” means “son,” and “thesia” means “a placing;” so, a placing as a son. In these scriptures adoption of children is figuratively a Christian sonship in respect to God. At that time and culture, it was a father’s public declaration that his natural-born child was officially a son or a daughter with all the rights and privileges of heirship. My salvation, your salvation, is far more than God’s forgiveness of our sins and deliverance from the shackles of this world. We are blessed because we are children of God, having been brought back into His spiritual family. Oh, such a privilege, for we will be like Him one day. And every month is a blessed adoption month for us as we are Jesus’ brothers and sisters. Abba Father, I am so honored, so touched, by the benevolence You show me. I come to You with praise and thanksgiving as Your daughter. I draw near and know how beautifully loved I am. You never lost sight of me, no matter how far I wandered. And You brought me into Your fold in Your perfect time. Thank You, Abba. And I so I love You, my Abba Father. In the Saving Name of Christ, I pray, Amen. Linda Gill is a quiet woman growing each day in the LORD. She became His 22 years ago, and is in a Christ-centered marriage of 22 years to Kenneth. They have no children. She is a retired elementary school teacher and children’s librarian, and now tutors primary-aged public school children. For fifteen years, she cared for her mother through dementia, diabetes and a terrible fall demanded help for her. She is grateful for the love God gives her so that she may give it away. 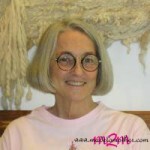 You can email her or follow her on her blogs, Being Woven and The Reader & the Book Reviews. Find her on Twitter, Pinterest, and Google+. Thank you, Wynter, for sharing my story of adoption with your readers. I write from the only perspective I truly can call mine on this topic. Thanks so much for allowing me this privilege. Thank YOU, Linda! Have a blessed Thanksgiving! And I wish you a sweet Thanksgiving as well. Thank you for inviting me here for this purpose. God’s purposes are above and beyond what we could imagine. How great!! I am praising the Lord, Kristin, for His grace, His mercy. Thank you for sharing this beautiful testimony, and reminding us that we have been adopted by the King of Kings and Lord of Lords. All the love, grace, and mercy we receive from our Heavenly Father as His adopted children is such an amazing gift. Oh, those gifts, Karen, are such a blessing to each of us. So glad you came by. What a great way to describe adoption. Many blessings to you. Thank you, Janis, for your encouragement and for coming by. I love that Romans 8 passage and the mystery of how even our suffering bonds us to Him in a special way. Thanks for this rich and theologically deep post, Linda!